Like Catherine, (Hello again, yoga– I’m back!) I’ve returned to yoga. I’m a big fan of hot yoga. Well, actually I’m mostly a fan of the heat. Mid-winter I often feel like I could just move into the hot yoga room. I arrive early. I leave late. I walk home hot and steamy through the snow. I love it. There’s a bit of an age gap between me and most of the women in the hot yoga studio. That’s usually okay. I like young people. But the instructors are also pretty young and sometimes it can be grating. I’d had a really tough week. My father died last month, I’ve got teenagers coming and going and struggling to plan their lives, I’ve got a partner about to have major surgery (not life threatening but still) that involves possibly two weeks in hospital and a couple of months off work recovering, and things in general aren’t ticking along the way they usually do. I’m not my usual resilient cheerful self. After a super tough weekend that followed the tough week–exercise was all that was helping and I’d already been for a run, done a two hour bike trainer class and thrown people around and been thrown around at Aikido–I decided to end the weekend on Sunday with an 8 pm Power Flow class at the hot yoga studio. Stretch and bend! You have no idea who is in your class and what they’re going through. I did a quick headcount. 32 people. And I thought, you really don’t want 32 people getting in touch with their true feelings in this very small, very hot room. And then she continued telling us that when we got home we don’t have to do the dishes, we don’t have to pack that lunch, and we don’t have to do our homework. It’s okay just to focus on you, she said. At that point I wanted to raise my hand and say that actually I did have to do the dishes and pack lunch. And homework? How old are these people? Probably they did really have to do that homework. I think I’m ready for masters yoga. Middle age lady yoga. Or even silent yoga. I’d do naked yoga if it was quiet. Music would be fine. BUT NO TALKING! Yoga with no sermons and intention setting. I like my yoga light on metaphysics, I knew that, but it also turns out that I like it without life advice! How about you? Are you inspired or annoyed by yoga sermons? I might be grumpy enough these days for Angry Yoga. Previous Post Looking for an indoor activity that’s good for you? How about knitting? Love that video! Our teacher really only talks about intentions and gratitude. Which I don’t mind. I just take from it what I need at the time. Sometimes I’m inspired and other times I close my ears and go off into my own little world. Fun post! I can relate. That’s why I love Yoga Centre London–mature instructors and students. But it’s not hot. 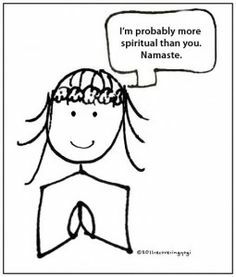 At hot yoga (which I too do for the hot room) I have to spend a lot of time shutting out the young instructors who think they are spiritual gurus. I remember once meeting with the owner of the studio to complain about an instructor who kept telling us — almost shaming us — to smile. I said, “I don’t come here to be told to be cheerful if I’m not. I come here to do yoga.” Not quite the same direction as what yours was saying, but irritating in a similar way. I also remember once an instructor saying something about 9/11 on the anniversary of 9/11 and I was like “say what?” Again, I’m here to do yoga–just take us through the sequence and lose the commentary, dude. so I shut them out so I don’t tell them to shut the f**k up! Great post. Sorry you’ve had such a rough time with no real end in sight. Wonder when the youngish instructor will see the light in her yoga speeches. Or who will tell her. I’ve seen that 22 minutes comedy skit before. Funny! I don’t mind some mindfulness talk and I can find some of the silly analogies people use helpful for thinking about alignment, but I struggle to take life advice from a youngster with his or her shiny yoga certification. I can be a yoga snob, though. I’d rather put a DVD in if I’m just going to stretch. If I take a class, I want it with someone with a serious personal practice who has done more serious training than a 200-hr certification course. Reblogged this on Riechel Web Blog. I’m with Tracy, Sam: the masters yoga is at Yoga Centre London. Best practice ever. Give it a shot with me sometime. Also: yoga, as we all know, is in the business of selling. The spirituality is a commodity. The instructors must drink the kool-aid to survive; otherwise they’d never stop throwing up. Sadly, our most popular guru shop here in Westernville is run by an extremely adept businessperson who has so totally woven the commodification into the ‘accept yourself’ model that it’s laughable… If you’re a critically engaged, middle aged prof. Which is why that shop’s target demo is coeds. I can’t stand the yoga sermons… I like body awareness commentary – reminders to focus on breathing, feel stretch in certain areas of the body, etc. But really I just want instructions on how to do the poses. I just came across this – a bit late to the party! I also hate yoga sermons but have to say I thought the age focus part of this was a bit unfair. Just because someone is in their 20s or younger doesn’t mean that they don’t have a parent who has just died, someone to care for, dishes to wash up. I also think it is interesting how the yoga age dynamic has changed. My mum (58) has just re-started yoga in the last few years. She says when she used to do it in her 20s yoga was full of “old hippie women” (her words!) but now it’s much more mixed in terms of gender, age, reasons for doing yoga etc. So I don’t think you need a masters yoga class, just a better yoga instructor! !